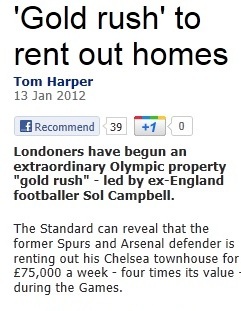 According to the Evening Standard, footballer Sol Campbell has kicked off a ‘gold rush’ to rent out homes in central London for the Olympics. I can’t work out whether the rental estimate of £75K (four times its value) for his house is a typo or if it’s meant to refer to the usual rent per week for such a house. If someone can show me where you can get a Chelsea townhouse for under twenty grand pcm, then I’ll probably be right up there letting my house out to travelling VIPs too. That would be one hell of a deposit – if you consider that the majority of landlords ask for six weeks’ rent up front as a deposit, plus another month’s rent in advance, that’s a cool £750,000. Having said that, they’d probably only want to rent Sol’s gaff for the couple of weeks that the Olympics is on, maybe with a few days for shopping and sightseeing either side. So let’s say three weeks all in. That’s still £225,000. Or in words, two hundred and twenty five thousand pounds. Eek. Rents aren’t cheap in London but that’s just silly. What do you get for your £75K per week? Again, thanks to the Standard, we know that the lucky tenant will be able to avail themselves of a cinema, gym and spa, seven bedrooms and secure underground walkway into a mews house for two residential staff. So they’ll even be able to bring their own servants with them (presumably the rent doesn’t include domestic staff). According to this article in the Graun last year, ‘a power shower, Wi-Fi, flatscreen TV and a high standard of decoration are a must’, so if you happen to own a dodgy flat above a shop in Leyton which hasn’t seen a paintbrush since 1976 and smells of cat pee then you might struggle.